To start, I wondered whether various states’ statutes permit a corporate incorporator. I have not researched all states. However, for the states that I did research, statutes do expressly allow a corporation to form another corporation. Delaware General Corporation Law Section 101(a) – Any person, partnership, association or corporation, singly or jointly with others, and without regard to such person’s or entity’s residence, domicile or state of incorporation, may incorporate or organize a corporation under this chapter…. California Corporations Code Section 200(a) – One or more natural persons, partnerships, associations or corporations, domestic or foreign, may form a corporation under this division…. However, when we look at filed documents, we see greater variation among the states. Examples follow. Maine’s Articles of Incorporation include fields for each “corporate incorporator”. Arizona’s Articles of Incorporation accommodate one or more “corporation[s] as incorporator[s]” (or “LLC[s] as incorporator[s]”). Delaware’s Certificate of Incorporation and accompanying instructions do not expressly address a corporate incorporator. California’s Articles of Incorporation provide a bit of a surprise. As with Delaware, the corporation as incorporator is not expressly addressed. 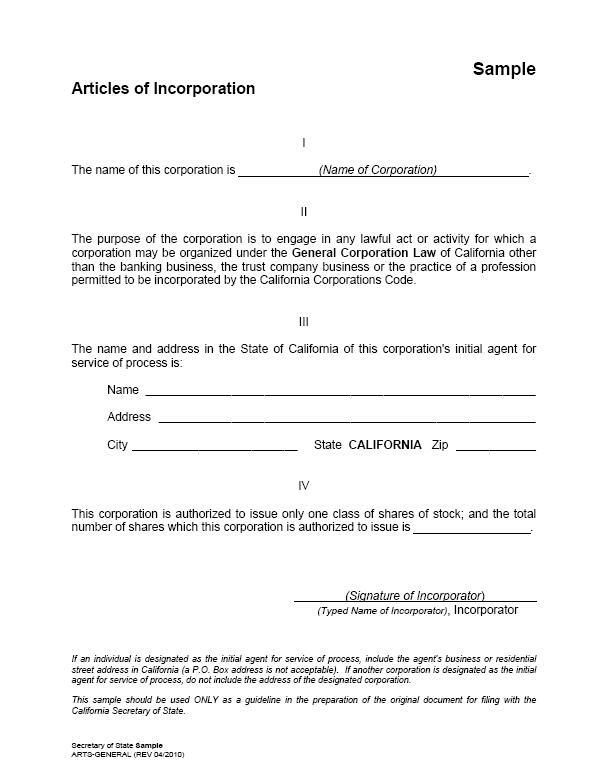 The instructions state that the form “must be signed by each incorporator.” But they further instruct, “Do not include the title of the person signing.” In other words, if you sign on behalf of a corporation as incorporator, you apparently cannot state your title at (relationship to) that corporation. This means that the Articles do not disclose that the incorporator is a corporation rather than an individual!